After many years (or not so many years if neglected) it’s simply time to renew the stucco on your home or place of business. It’s not just a matter of appearance. Stucco wall cracks often mean water leaks, and that means hidden damage to insulation, the structure, and even interior drywall… sometimes extensive and expensive. 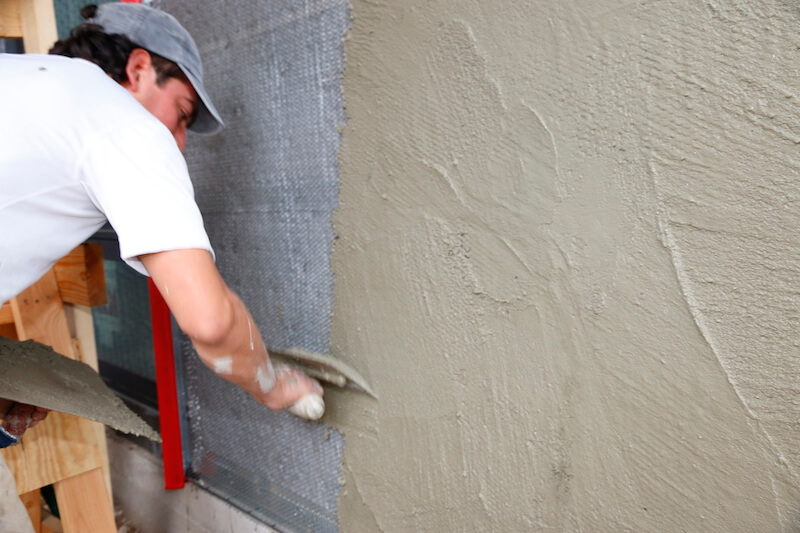 To get the job done right calls for experienced and professional stucco contractors. Anything less risks problems down the road. As leading remodeling contractors, we’re ready for stucco wall restoration with sandblasting, repair, and stucco finish services. We’re a fully licensed and insured general contractor with stucco company specialists. So we’re also ready for any necessary wood and structure repairs, lath work, plastering, and fireproofing work you might need. We always deliver quality materials and workmanship using proven methods following our detailed checklist, while staying up to date with the latest products and industry best practices. Combining that with great customer service, we guarantee your satisfaction. Stucco finishes are a special combination of cement, sand, and water that results in durable fire, insect, and rot-resistant walls. It’s used far and wide as a traditional SoCal finish, and yes it does keep a house cooler than wood or aluminum siding. But re-stuccoing is difficult requiring special skills, and is labor intensive. It takes a trained professional eye not only for the best appearance but to be on the lookout for problem indicators such as stains, cracks, bulges, depressions, and soft areas. As stucco contractors we’re well equipped to provide restoration, including stucco ceilings and stucco siding in a variety of colors. Our experts are tops in color and texture matching, and stand head and shoulders above other stucco companies and repair services. As required we can tear down areas to install proper lathing for longevity, and usually include sandblasting as part of our preparation. We have specialists in critical fireproofing plasters, multi-layer stucco application, and single-layer EIFS stucco surfaces. My Space will start and finish right on schedule, including a complete clean up. You can count on us to take the time to everything properly. That may increase the cost a bit, but it’s a wise investment for longer lifetime and a better look. Just call us for a no-obligation free estimate.